I am busy preparing everything for my "Year In Daylesford". For those that don't know as of this Thursday I am looking after "Old Chilli Bed & Breakfast" in Daylesford for two of my very dear friends Tim & Brian. They are of to Canada for 12 months and have put me in charge of their business. I had a trial weekend a few weekends ago and I must say I just loved it. 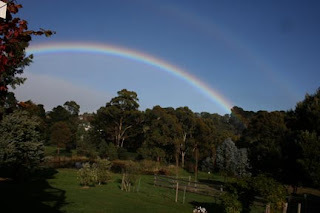 On the Monday morning the day greeted me with the most beautiful rainbow. Oh I think I am going to enjoy my Daylesford adventure. Wow, the time has passed so quickly! Here you are about to embark on a year long adventure and it seems like only a few short weeks ago you were mentioning doing this. I'm sure that you're going to enjoy yourself, it seems to me that you adapt very quickly to new surroundings and in no time at all the year will be done and you won't want to leave! lol Where in Canada are your friends headed to or will they be traveling all over the place? Have a fantastic day and all the best to you! Brian is Canadian so they are doing a bit of traveling with his family and then working in Vancouver for a bit. Good for them, it sounds like a win-win situation for both you ad your friends! Look forward to hearing all the happenings as you have time to share!